I received the products used in this Soft Claws review in exchange for my honest review of how life is after no longer having holy shirts or carpet shreds every where. ;) This post may also contain affiliate links. As many of you may already know, we have 4 cats who we love dearly. That also means 4 times the claws and scratching fiends. ;) Luckily, we have not had many problems with the cats scratching things they shouldn’t (though they do like to scratch on the carpeted stairs now and then unfortunately), probably mostly thanks to clipping their claws regularly and having cat trees and other cat scratching items throughout the house. We have had an issue before, though, when one of the cats scratched another cat’s eye when playing, or when they scratch us when they don’t mean to, or put holes in our shirts when we need to hold them, etc. etc. Charlie with her blue glitter soft claws. However, clipping one or more times a week can be quite stressful for both us and the cats. I personally do not support declawing cats, unless it is for a health benefit to the cat or owner, because of the negative ramifications it poses to the cat for the rest of its life. 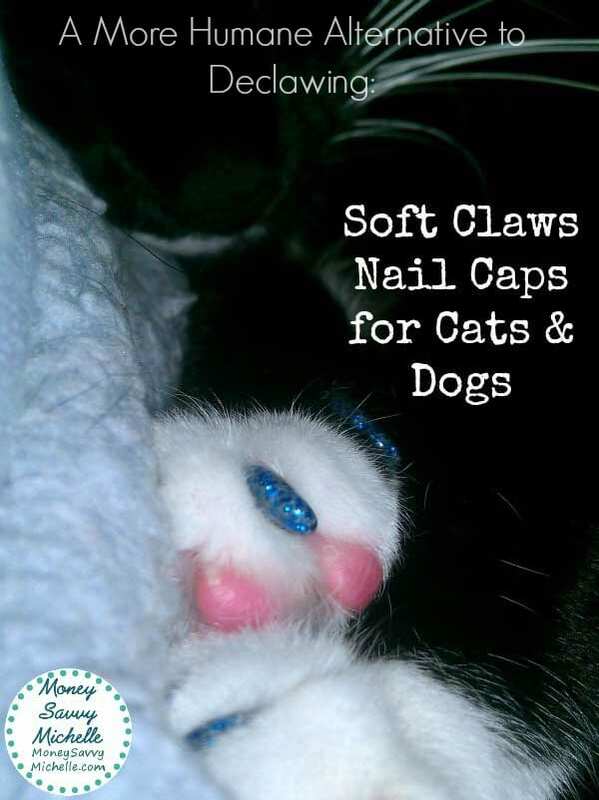 So, when I heard about Soft Claws (sometimes referred to as Soft Paws), a product that is non-toxic and much more humane than declawing, I was eager to try them out. Think of Soft Claws as being like a fake nail, just for cats and with the benefit of keeping your cat from being a living breathing shredder. ;) The Soft Claws are very easy to use and put on. You simply open the glue, apply the applicator and then fill the nail tips with glue. The most difficult part at first is knowing exactly how much glue to put in. On the first application, we used a minimal amount of glue when applying the tips to our spazziest cat. A few days later, she had gotten about half of them off, so we applied more caps to the bare claws, only using more glue this time, and they are still there a couple weeks later. Heads up: the glue should be stored in the fridge after opening. Applying the cat claw caps is relatively easy, just make sure you get the correct size caps. I got the medium size for the females and the large size for our males as they are rather large cats. The biggest help is to have someone fill the caps with glue while the other person holds the cat and applies them. Just make sure that you “pinch” the cat’s claw so that it fully extends and then gently tap it on. If your cat doesn’t like to be held like most of mine, I find the best position is to hold the cat against one of your sides while sitting. I was afraid it would be impossible to hold my cats for the 5 minutes to make sure the glue dried, but I just petted them and offered some of their favorite cat treats and they were fine. The cats did obviously go for their claws as soon as they were let go and tried to get them off, but with the additional glue, they were unable to do so and seemed to no longer notice them or try to get them off a couple days later. I knew that when they were still able to catch toys with their claws and were stretching, scratching and climbing on their cat tree as normal, along with “making biscuits”, that the Soft Claws were going to be a great solution for us for some time to come. It is very difficult to get clear pictures of my cats for they don’t stay in one position too long and seem to magically know when I’m trying to take pictures even if they appear to be in a deep sleep. But, I did manage to get one picture of Charlie sporting her blue glittery claws that you can see at the top. Chewie was turned into Santa Paws with alternating green and red claws and the boyfriend wanted to give Marvin, our short-haired solid black cat, all red claws which looks quite amusing, especially when he’s playing. We opted to not put them on our other cat yet because she has had some allergy issues that have irritated some of her claw beds. I have to say that while I am not the type of person to dress up my pets, the claw caps look so cute and I love that they come in a variety of colors so you can choose your favorites or go with holiday themes. Final Takeaway: Soft Claws will be an item we continue to use on all of our cats thanks to the fact that they are non-toxic and allow our cats to live normal happy lives without having to worry about negative outcomes from sharp claws. This is honestly one product I couldn’t find anything negative about! Update: I originally wrote this Soft Claws review back in Nov/Dec 2012. It’s now June 2013 and we still love and use Soft Claws on all of our cats regularly! We have found that the cleated version definitely stays on longer and haven’t found any issues with them other than that you do need to be careful playing with thin string or wire toys like the Cat Dancer 101, or if your cat likes playing with the blinds string as they can potentially get caught around the Soft Claws as they begin to grow off when your cat swats at the toys. 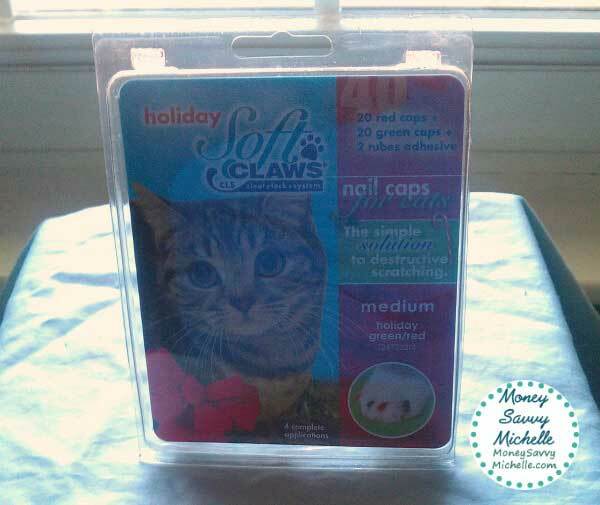 Buy It: Soft Claws can be purchased at Amazon.com for approximately $13 – $16 per 40-cap package as of June 2013. Disclosure: I received 4 packs of Soft Claws in order to facilitate my honest review. No other compensation was received. All words and opinions are based on our own personal experiences with the product. Check out our other reviews if you enjoyed this Soft Claws review! I’m so glad a found your resent review. All the others were from 2006-2007. We have a Blue Persian, Mr. B aka Berlioz who has shredded the dining room chairs and banisters for HIS pleasure. He is to old to declaw, 8 years and I don’t believe in declawing but the damage is horrid. We are about to redo the stairs at a whopping $2000, he loves wood and yes we have post, carpet, wood and anything else we think he may like. So I needed something up to date. Love my boy but don’t love the shredding. My vet does not believe in declawing, I will have to try these. I have one inside cat, he loves to scratch.